Charlie and his sister have so far managed to survive the zombie apocalypse even though Charlie is only 15 and his sister is mentally handicapped. They have been fortunate to meet up with decent people until that is they come across Chuck and his group. Chuck is contemplating killing them before a zombie horde descend on them and they find an ally in one of the group. As the night continues Charlie sees what Chucks true intentions are towards him and his sister and he is pushed into taking decisive action. I was surprised with how much I enjoyed this, it's very short at just 28 pages but the author has successfully managed to write a very likeable lead in Charlie. There were a couple of times that the writing felt a little awkward but for the most part the story was smoothly written and well paced. One small niggle was that the ending felt a bit abrupt but for such a short read that's not a big complaint. 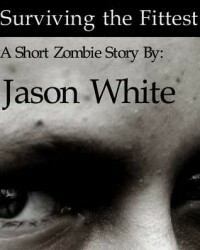 A good survival story that shows the depravity of man is still more terrifying than the undead.